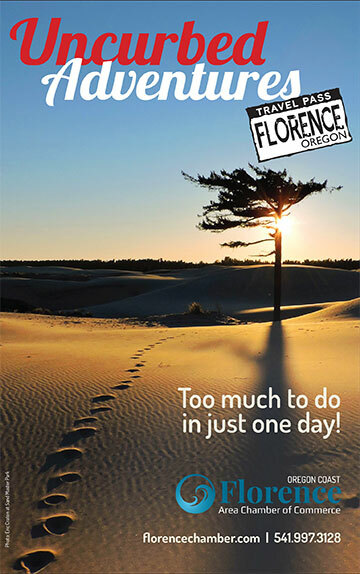 You are invited to create your own Uncurbed Adventure with Florence, on the Oregon Coast, as your home base. Visitors as well as locals know there is Too Much To Do In Just One Day and many of those adventures are only found along Florence’s 40 miles of coastline. Start your multi-day adventure by selecting from nearly a thousand RV sites of every variety, with locations and options galore to choose from. For example, do you like to be in the heart of the action, close in to town with all the latest conveniences such as WiFi? We have that. How about a private, rustic spot close to the beach, on the river or sitting on a lake shore? Boat dock for your kayak? A wandering trail to bike or hike? You can enjoy all of those and more when you visit. With private RV parks as well as state and county parks, your choices are endless. Once you’ve settled into your RV spot of choice, though, your adventure at the Oregon Coast is only beginning. It’s time to “uncurb”! As adventure calls, put a kayak in the river or one of the 17 lakes, cast your line from a guided deep-sea fishing boat, or soar over the beaches and dunes while kite surfing. If you seek thrills at a higher altitude, check out the scenic aerial tours available locally and choose between the serenity of a helicopter flight or the thrilling experience of a WWII biplane ride. Try renting a sand board for an extraordinary escapade on the tall dunes. If dune-buggy riding is your choice, take your family on a fun-filled tour-guided ride or bring your own off-road vehicles and go exploring. If you seek a slower pace, ride horseback on the beach for an exhilarating way to enjoy the unique scenery of the Florence coastline! And don’t leave those golf clubs at home – the incomparable views of land and sea at the two world-class 18-hole courses bring the golfer a day of memories only found here. For a day trip, travel north just a few minutes and make a quick stop for a short hike through the 18-acre Darlingtonia State Natural Site where you will see a rare plant species protected by the state of Oregon. Then it’s on to visit Sea Lion Caves, the largest in the nation, hidden inside the shoreline cliffs. As you come upon the view of the expansive coastline far below the cliffs along Hwy 101, you’ll see rhythmic waves roll on to miles of sandy shore. The Heceta Head Lighthouse, one of the most photographed in the world, sits high on the rocks overlooking natural icons such as Devil’s Elbow. There are daily tours of this working lighthouse, which was recently restored to its original splendor. A quick trip south might entice you to take a hike through old-growth forest or over the dunes for a view of the sea unique to Florence. The Siuslaw Water Trail offers over 30 miles of paddling opportunities, or you can beach comb, clam dig or build a castle to rival the dunes. It’s a day filled with sunshine & rolling surf.